Half of the peaches are cooked down into a thick, chunky, jam-like texture. 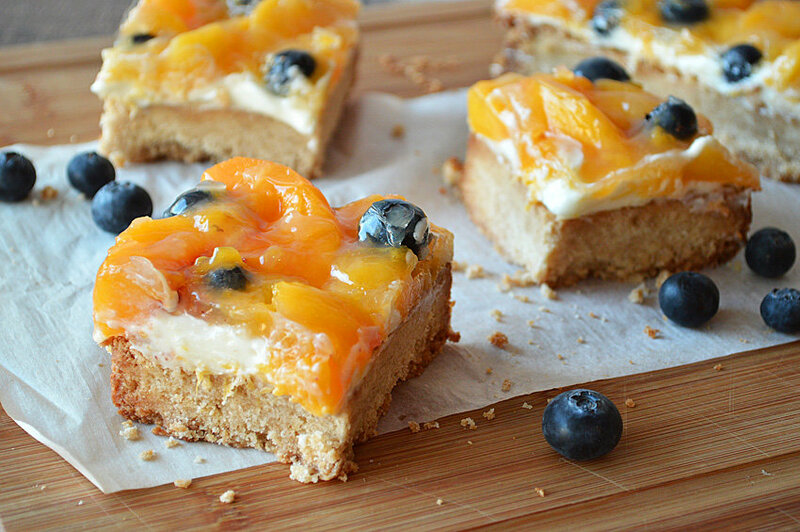 The rest are mixed with fresh blueberries atop a layer of sweetened cream cheese. Tofutti brand makes a great vegan cream cheese substitute! The base of this cookie is an almond shortbread-type bar cookie. I actually adjusted the recipe down a bit because they puffed up a bit more than anticipated for my liking in this 8″x8″ pan. I prefer a better ratio of cookie to fruit. And it’s a dense cookie. Feel free to improvise with any fruit you have on hand. Strawberries, blueberries, raspberries, pears, you name it. They would all work well in this versatile recipe. I think they make a stunning presentation. 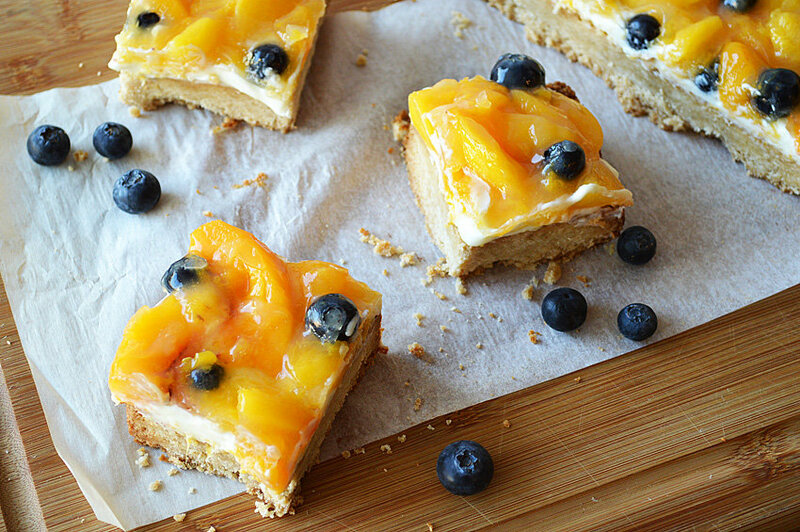 You could also substitute the sugar in the cream cheese mixture with some vegan white chocolate. That would be amazing too. If you want to be really decadent, add a dollop of our coconut whippped cream! Combine all cookie base ingredients either by hand or in a food processor until coarse crumbs form. It will look like moist sand and not look like it will hold together at this point. Line an 8"x8" pan with parchment (allowing for some overhang which will make removing easier) and lightly spray with cooking spray. Firmly press the cookie base into the bottom of the pan making sure it is even, center to edges. Use the bottom of a glass if necessary. Bake for 20-30 minutes until golden and fully set. It seems slightly soft when you first remove it but crisps up nicely as it cools. Allow to cool completely. In a small bowl, combine the cream cheese and powdered sugar. Set aside at room temperature. In a small bowl, crush 1/2 of the peaches. In a small saucepan over medium heat. Add sugar and cornstarch. Stir in the crushed peaches and water. Stir constantly until mixture boils and thickens. Set aside to cool for 10 minutes. Gently fold in the remaining peaches and the blueberries. On the now cooled cookie base, evenly spread the cream cheese filling. 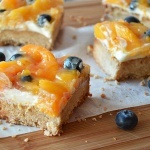 Top with the peach and blueberry mixture and refrigerate for 1 hour or until set. Peaches are my absolute favorite! These look so good, just perfect for summer! I am going to try a gluten free version! What a beautiful looking treat! Adapting this recipe will be easy. This is fabulous! I subbed coconut oil for the shortening and I used Gluten free flour for the flour. FABULOUS! Thanks for the recipe!! Just wondering about the use of vegan sugars???? Sugar doesn’t have animal products it! What is vegan sugar? BTW…your end product looks fabulous! I hope to try it! Thanks for sharing!